Was founded on 1 October 1919 was the result of two centuries of economic and cultural traditions of the Yugoslav Slovaks. Its first building was built in 1923, the money being raised from voluntary contributions, financial assistance of the Czechoslovak government and Slovaks from overseas and a great deal by voluntary work of the inhabitants of Backi Petrovac. 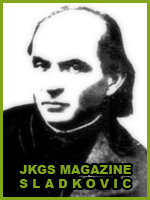 The JKGS has become an important cultural institution of the Yugoslav Slovaks. There began professionals careers of many academicians and Ph.D.s (working in Yugoslavia and in the Slovak republic) as well as many scientists, teachers, artists and engineers. Although this Grammar School has been founded to satisfy the need of the Slovak minority (it was and still is the only Slovak secondary school outside the territory of the Slovak Republic), it has never put up the barriers against other nationalities. IT HAS ALWAYS CO-OPERATED WITH THE LOCAL COMMUNITY searching for good solutions, for instance, it has set up a class for Serbian students. On the top of a good material basis and indisputable quality of teaching, typical for the work of the JKGS are ample EXTRACURRICULAR ACTIVITIES OF THE STUDENTS AND THE TEACHERS: students’ societies, clubs from various scientific fields as well as art and sports clubs. Self-educational literary society called ‘Sladkovic’ exists continually since 1 October 1925 till today and due to it the Slovak literature in Yugoslavia is still vital. In the academic 1947/48 on the premises of the JKGS was founded THE TEACHER TRAINING COLLEGE. It was of great importance and impact on the fates of the Slovaks living in the Province of Vojvodina in the sense of getting to know, spreading and improving their own culture, language and identity. Until 1965 more than 200 students completed their studies after which it was closed. Today, its continuation (from the academic 1998/99) is one Slovak group of the teacher training college which has a seat in the city of Sombor. In the academic 1997/98 a MODERN BOARDING HOUSE was opened. It was built with the financial help of governments of The Slovak Republic and The Republic of Serbia. It gives a possibility for learning in mother tongue to the Slovaks from the entire Province of Vojvodina, although its capacity (75 BEDS) is not sufficient for the demand and interest of the students who would like to attend this school. The school’s facilities satisfy requirements made on a modern school. It has FULLY EQUIPPED ROOMS FOR NATURAL SCIENCES, TWO COMPUTER ROOMS, PERMANENT ORNITHOLOGICAL EXHIBITION, A LIBRARY WITH MORE THAN 20000 BOOKS AND A GALLERY OF ART WORKS as well as one room dedicated to the 14 VUSB (the Slovak brigade during the Second World War) which commemorates a recent history. Students can play various sports on the SPORTS FIELDS (basketball, soccer and volleyball) of the school’s campus. In total, from the founding till academic 2000/2001 3191 STUDENTS HAVE GRADUATED FROM THIS SCHOOL. A GREAT MAJORITY OF THEM HAVE SUCCESFULLY FINISHED UNIVERSITY. In accordance with the progressive tradition, the JKGS nowadays also tries to keep up with the most modern trends. The school has become one of the five regional centres for the further education of teachers. Also, they founded The Association of Slovak Teachers. THE REGIONAL CENTRE FOR THE FURTHER EDUCATION OF TEACHERS came to existence at this school in the year of 2000. It was a natural result of the school’s involvement in the PROJECT OF THE OPEN SOCIETY FUND CALLED “THE THIRD MILLENIUM” (since 1997, when The Fund has equipped the school with the most up-to-date computer technology) its aim is to introduce new technologies and ways of communication into the educational process, and expand them on as many subjects as possible. Creation of educational programmes related to the improvement of the teaching methodology and schools curricula. USAGE of the most up-to-date methods and teaching aids. Currently, The Associations is intensively working on achieving these goals.